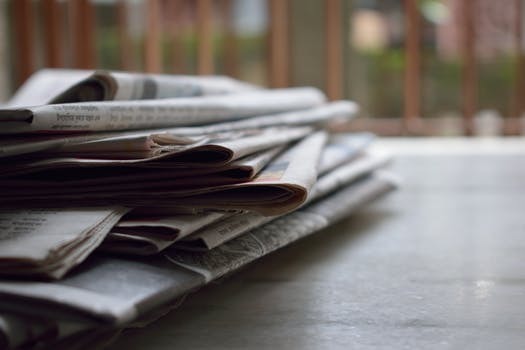 There’s an interesting article in the Daily Mail (yes, really…) about ‘reproductive harassment’ after actor Jennifer Aniston spoke out about being judged and repeatedly questioned about when and whether she is going to have a baby. As she is now 49, this seems a somewhat insensitive question, and yet the pressure on her to reproduce has been kept up by the media for many years. It’s bad enough feeling that pressure in your everyday life as a normal (non-celebrity) person, but imagine how it must feel to see your childlessness discussed by people who know nothing about your individual situation in the global media. The article explains that this kind of questioning is most often aimed at the woman in a partnership or at single women, and yet people would rarely consider cross-examining a single man in his thirties about when he is going to get round to having a baby or suggesting that he ought not to leave it too late. As Jennifer Aniston has pointed out, women without children are often judged and misunderstood. She has now hit back saying that maybe her purpose on this planet isn’t to procreate, and that maybe there are other things she is meant to do. Her words will resonate with many of those who have experienced involuntary childlessness, but who have gone on to have very happy and productive lives without children. Check out Lesley Pyne or Jody Day if you are looking for inspiration. It was great to see so many people there for the book launch, including the team from Fertility Network UK (Lesley is pictured here with Fertility Network UK Chief Executive Aileen Feeney) and fellow author Jessica Hepburn.The guests included many of Lesley’s friends from More to Life, the part of Fertility Network UK which works with those who are living without children. It was a testament to those lasting friendships that Lesley – and many others – found through the organisation to see so many of the group Lesley first met when she first joined Moe to Life still there and offering their support. 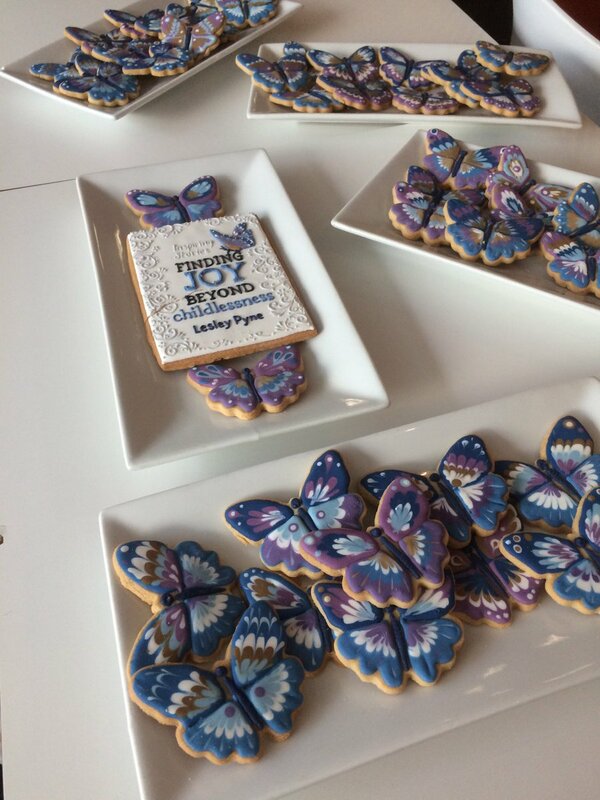 Lesley’s motif is a butterfly and the tables of books were also covered in piles of beautiful butterfly biscuits, carefully colour-coded to match Lesley’s book cover and website. Lesley works as a coach, supporting others through childlessness, and you can find her guide to a more fulfilling life in the book Finding Joy Beyond Childlessness which is available in paperback and for Kindle, and you can buy it via Amazon. Can you be happy if IVF doesn’t work? 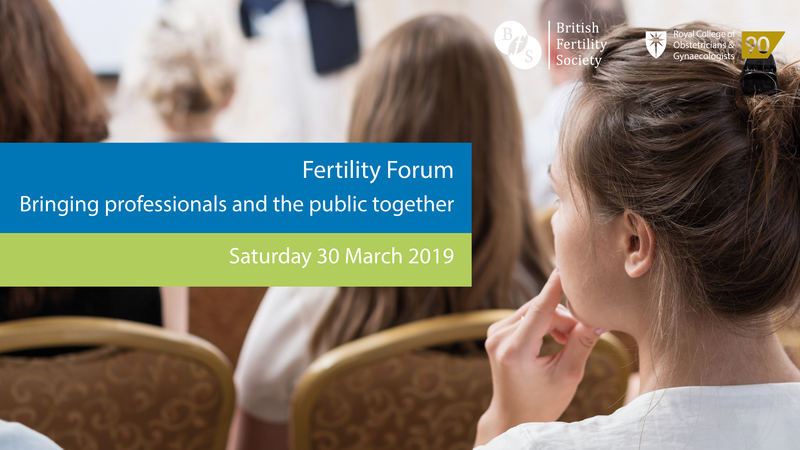 It’s one of those things people don’t even want to think about when they’re going through fertility treatment – what might happen if it didn’t work, ever? Could you really be happy if you didn’t end up with a baby? What would you do if all that time, effort, money and emotional investment led to nothing? Would your life ever feel fulfilled and enjoyable? Could the overwhelming sadness go away? I want to tell you about someone who is a brilliant example of the fact that life after IVF treatment can be both fulfilled and enjoyable. She’s called Lesley Pyne, and I first met her when I was a trustee for the charity which is now Fertility Network UK. 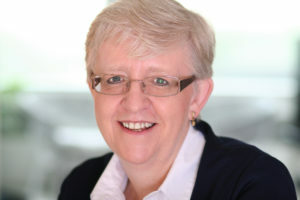 Lesley was one of my fellow trustees, and had joined as she was involved with the section of the charity for people who were involuntarily childless known at the time as More to Life. Today, I met Lesley for the first time for a while and it struck me that she looked about 10 years younger than she did when I last first knew her – which means she must look about 20 years younger than she really is! Her eyes were bright and shining, and her zest for life was almost palpable. Lesley, who always seemed to be making an effort not to stand out when we were fellow trustees, was dressed in bright colours with electric blue nails. She is happy, she is making the most of the good things in her life – and she has just written a book explaining how she went from feeling devastated by unsuccessful treatment to this confident, happy woman who gets the best out of her life – it’s due to be published in June and is called Finding Joy Beyond Childlessness. It strikes me as we talk that Lesley has embraced something we could all learn from – living for the moment, focusing on the positives and making an effort to enjoy what we have. I haven’t read Finding Joy Beyond Childlessness yet – but she explained that it contains her story and those of a number of other women who have come out the other side of involuntary childlessness to find fulfilment. She says it is a journey, and it can be hard along the way, but that there is life beyond childlessness, there is more to life – and if you need help along that path, keep an eye out for Lesley’s book when it comes out in June. Feeling fed up with January? If you’re fed up with people DOING things for January – whether it’s Dry January, joining a spin class or taking up tap dancing – you may like to read Lesley Pyne’s latest blog post. 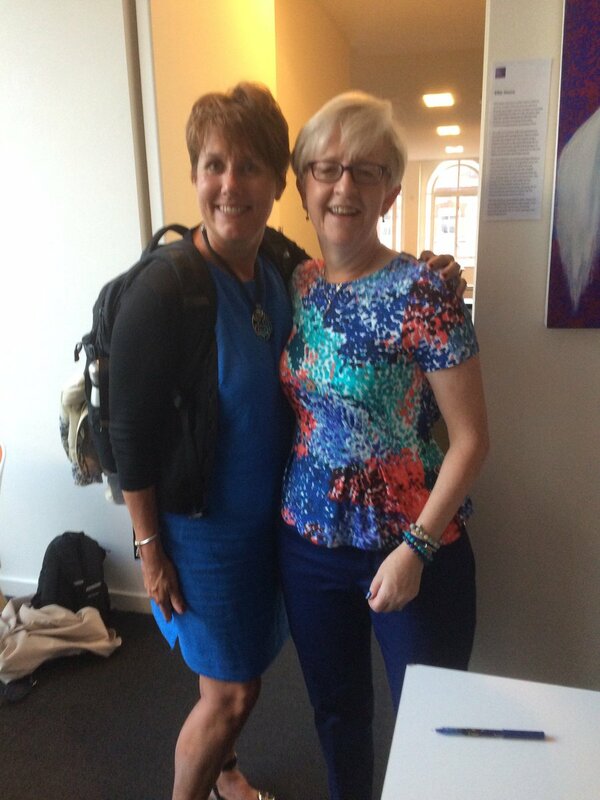 I’ve known Lesley for a long time and have witnessed her building up her support network to help other people who are experiencing involuntary childlessness – she offers lots of support and inspiration for anyone living without children, and has helped many people through their own difficult times. You can sign up for regular emails from Lesley which offer tips and advice. What’s more, she’s right about January and people doing things – it can be exhausting to be faced with other people’s bouncy enthusiasm when you’re just trying to get through things yourself. One of the things I do in my role as London Representative for Infertility Network UK is to organise get-togethers for patients at our London support group. Last night, we invited Lesley Pyne to come along to talk about coping strategies which was one of our most popular evenings to date. Lesley taught us some techniques to help deal with difficult situations and there was a lively discussion with members of the group who had lots of questions about coping. Lesley explained how she had got through her own decision to give up fertility treatment and talked about the need to look after yourself, to allow yourself time to grieve and to seek help when you are finding things difficult. 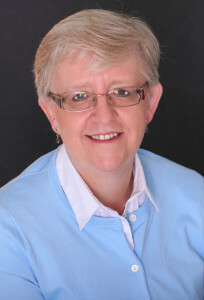 You can find Lesley’s website, full of helpful advice, here and if you would like professional help from a counsellor, you can find a list of specialist fertility counsellors on the British Infertility Counselling Association website here.